By the mid-2000s, the press was calling Australian actor Hugh Jackman a jack-of-all-trades. American moviegoers lined up to see him in the X-Men blockbusters, in which he played the ultimate alternative superhero: the brooding, razor-clawed mutant known as Wolverine. On the Broadway stage he received rave reviews for portraying flamboyant Australian song-and-dance-man Peter Allen in The Boy from Oz. In 2004 he landed a Tony Award, Broadway's most prestigious honor, for his role. Whether Jackman was wearing metal claws or clicking castanets, he earned praise from fans and critics alike. Jackman also added another term to his resume, that of America's favorite leading man. Hugh Jackman was born on October 12, 1968, the youngest of five Jackman children, and the only one born in Sydney, Australia. The entire family had moved to Australia from England in 1967, the year before his birth. When Jackman was eight years old his parents divorced. His mother returned to England to live and care for her own mother, who was ill; the job of taking care of the five young Jackmans fell to his father, an accountant. In interviews, Jackman cannot say enough about the man who devoted himself to his family. "He's an extraordinarily selfless, amazing man," Jackman remarked to Katie Couric on MSNBC News. Although his mother was not a part of his everyday life, Jackman did travel back and forth between Australia and England for visits. It was during those visits that he got his first taste of the theater. Jackman loved going to plays with his mother, and he frequently acted in school plays, but he did not consider becoming a professional actor. Instead he majored in communications at the University of Technology in Sydney, with an eye toward journalism. During his senior year, Jackman found himself a few credits short, so he decided to take a drama class, primarily because his friends told him that he was guaranteed an easy "A." But as it turned out, the class was a lot of work. "I was shocked at how challenging it was," he admitted to MSNBC News. The class project was to put on a play, and everyone had to take a part. By chance Jackman was cast in the lead, and by the end of the term he was hooked. "I act because I have felt in acting some of the most free moments in my life.... I think it's also one thing that scares me the most." After graduating with a bachelor's degree, Jackman realized that he was not truly cut out to be a journalist, so he enrolled at the Western Australia Academy of Performing Arts in Perth to study drama. The aspiring actor thrived in the experimental environment of the academy, where students were encouraged to work on instinct. As Jackman explained to David Furnish of Interview, "I studied in Perth, where you're totally isolated and in this bubble of creative fire and risk-taking." For the next three years Jackman immersed himself in acting, appearing in plays and taking classes in opera and musical theater. When he graduated in 1994, he had no clear expectations for his future. As Jackman told Furnish, "After I graduated I thought, 'Well, I'm going to give this everything I've got for five years. If nothing happens, I'll start my own theater company or whatever.... I'm not going to spend my whole life waiting for the phone to ring.'" T he X-Men series was created in 1963 by two Marvel Comics legends, writer Stan Lee (1922–) and artist Jack Kirby (1917–1994). The story originally focused on Professor Charles Xavier, who scoured the earth to find human beings who had been born with a genetic mutation that gave them each a special power. Xavier's goal was to provide a safe haven for the mutants, who were scorned and feared by society, and to help them harness their potentially dangerous gifts. The core group of X-Men consisted of five teenagers: Cyclops, Angel, Iceman, Beast, and Marvel Girl. The villain in the story was the evil Magneto, who believed that "normal" humans were inferior and had to be punished for their past treatment of mutants. Since then, the series has undergone numerous transformations. Superheroes have been added and subtracted, villains have come and gone, and spin-offs have been created that concentrate on specific characters. One particularly popular character is Wolverine. Wolverine was created in 1974 by writer Len Wein because Marvel Comics had no Canadian superheroes. He was introduced in an Incredible Hulk comic as a secret agent of the Canadian government who had ultra-super powers. Several months after the Hulk comic was released, Wein was given the task of adding new characters to The X-Men series. As a result, Wolverine found a permanent home. Wolverine is one of the toughest and most ruthless of the X-Men, and his mutant powers are many. He is incredibly strong and fast, and his keen sense of smell allows him to track almost any living creature. One of the most amazing things is that his skeleton has been infused with adamantium, a particularly strong, nearly indestructible metal. Wolverine has retractable claws built into the backs of his hands made from this metal. When the claws project through the skin of his hands, the flesh tears and bleeds, but because of Wolverine's self-healing powers, he mends quickly. Jackman did not have to wait by the phone for long. Almost immediately he was offered a plum role on the popular Australian television series Corelli . The program not only gave Jackman his first big break, it also gave him the chance to work opposite his future wife, Australian actress Deborra-Lee Furness. Following Corelli , Jackman appeared in a number of other TV shows. He also began to earn a reputation for his work on the stage in the Australian productions of Beauty and the Beast and Sunset Boulevard . In 1998 Jackman headed to London, where he drew even wider attention for his portrayal of singing cowboy Curly McClain in the Royal National Theatre production of the musical Oklahoma! Critics and theater-goers were so taken with Jackman's charming performance that he was nominated for an Olivier. The Olivier Award is the most prestigious theater honor in Great Britain, and is named for the renowned British actor Sir Laurence Olivier (1907–1989). Just a few short years out of drama school, Jackman had become the hottest actor in Australia. He not only had television and stage credits under his belt, he also found time to appear in two films, Paperback Heroes and Erskineville Kings, both released in 1999. For his turn as Wace in Erskineville, Jackman received a Best Actor nomination from the Australian Film Institute. Although he did not take home the prize, he was given an even bigger honor when he was named the Australian Star of 1999. Jackman may have been the biggest ticket in Australia, but he was not big enough to be considered for an ambitious movie project called The X-Men that was under way at Twentieth-Century Fox in the United States. The X-Men movie was based on characters from a Marvel comic-book series of the same name, and although the characters had legions of followers in the comic-book world, they were not well known by the general public. Executives at Marvel and Fox, however, felt the story had a timeless appeal, especially for a younger audience, since it focused on the exploits of a group of outsiders who are shunned because they are different. There was also the promise of a special-effects spectacular, because what made the X-Men different was that each was born with a special power. For example, Cyclops can fire beams of energy from his eyes. The character slated to be at the center of the movie was Wolverine, a shaggy mutant with keen animal senses and razor-sharp metal claws that spring from his hands. British actor Dougray Scott (1965–) was Hollywood's first choice to play the brooding Wolverine, but when another film obligation got in the way he was forced to back out. This left the studio in a bind just as the movie was about to begin shooting in October of 1999. Director Bryan Singer decided to take a gamble and tapped newcomer Jackman to replace Scott. When Jackman received the call he was stunned, especially since he had auditioned for the role ten months earlier. As he laughingly told Lori Blackman of CNN.com, "I think I'm in the record books for the longest audition in history." The gamble paid off when The X-Men far exceeded everyone's expectations. There was a buzz about the movie months before its debut, and comic-book fans, eager to finally see their favorite superheroes on the big screen, camped out in front of theaters to get tickets. When the film was released in July of 2000, it took in a record-breaking $57 million during its opening weekend, and by the time it went to DVD, worldwide ticket sales totalled almost $300 million. The movie also spawned a lucrative marketing franchise that included video games and action figures. By 2001, it looked like superheroes meant super business. In the process Hugh Jackman became an overnight celebrity. Diehard X-Men fans praised Jackman for his faithful portrayal of Wolverine. This was quite a compliment, considering the fact that the fictional Wolverine stands five-foot three inches tall, and Jackman is over six feet tall. In addition, Jackman's chiseled good looks and mutton-chop sideburns made him America's newest heartthrob. Studios lined up to sign the hunky Australian, and in 2001 Jackman had a banner year, appearing in no less than three movies, including Swordfish, a suspense drama starring John Travolta (1954–). He also co-starred opposite Meg Ryan (c. 1961–) as a time-traveling suitor in Kate & Leopold, and he played the object of Ashley Judd's (1968–) affections in Someone Like You. Jackman performed admirably in all three films, especially in Kate & Leopold, where he proved he could handle a romantic comedy as well as an actionpacked thriller. None of the movies did well at the box office, however, and critics considered the films to be fairly forgettable. In 2003 it seemed to many that Jackman was back where he belonged when he reprised his role as Wolverine in the X-Men sequel, X2: X-Men United. The movie not only repeated the success of the original X-Men, raking in an astonishing $85 million during its opening weekend, it was also considered by most critics to be even better than the original. Jackman, as Wolverine, was given a lot of the credit even though he was just one of an ensemble cast. Jackman was believed to be such an integral part of the big-budget fantasy's success that writer-director Stephen Sommers created a movie called Van Helsing specifically for him. As Sommers told Benjamin Svetkey of Entertainment Weekly, "I wrote Van Helsing with Jackman in mind. I'm not sure what I would have done if he had said no." But Jackman did not say no. He jumped at the chance to play monster-hunter Gabriel Van Helsing, who, in his sweeping duster and broad-brimmed hat, pursues the likes of Dracula, Frankenstein's monster, and the Wolf Man. When Van Helsing opened in May of 2004, it received mixed reviews. Some critics dismissed it as "summer silliness," but they also gave kudos to Jackman for his intense performance. Many, like Leah Rozen of People, wondered when the actor was "going to get a movie worthy of his true talent." Jackman claimed that taking the Van Helsing role was part of his plan to further his career. As he explained to Svetkey, it was a way to "make sure the projects kept getting more and more interesting and the parts more and more challenging." If some questioned his choice of playing the part of a monster-killer, others questioned Jackman's choice in 2003—performing on Broadway in The Boy from Oz, a musical about the life and death of singer-songwriter Peter Allen (1944–1992). But Jackman was itching to flex his acting muscles, and Allen was an Australian legend. As Jackman explained to Furnish, "[Allen] may not have been the greatest singer or piano player or dancer in the world, but when he performed, he just lit up the stage." 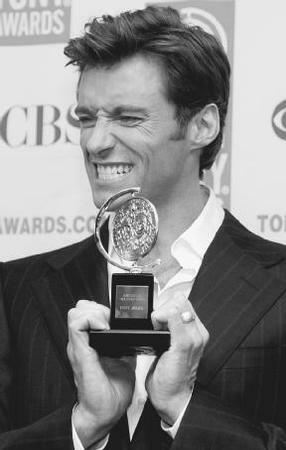 Hugh Jackman poses with his 2004 Tony Award. stand up and show off their outfits. When an actor ad-libs, it can be a disaster, but Phil McKinley, the Oz director, called Jackman a dream to work with. And he predicted great things for his leading man. "Hugh's going to have this amazing career where he truly will be an all-around superstar performer," McKinley commented to MSNBC News. Although critics were not particularly kind to the show, Jackman received the highest marks for his demanding role. He also generated an enormous following. A group of devoted fans, who called themselves the Ozalots, went to see him perform twenty or thirty times in a row. 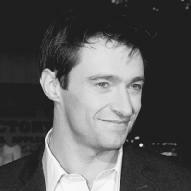 By June of 2004, Jackman had created such a stir that it came as no surprise when he won the Tony Award for Best Actor in a Musical. In October of 2004, when the run of The Boy from Oz ended, Jackman was only too eager to take a break. As he told Katie Couric, his plans were simple: "As soon as I finish ... I'm going to just hang out with Oscar." Oscar is Jackman's young son. He also explained that he might find time to fit in some gardening and cooking. Not the most adventurous schedule for a man known for playing dynamic characters on stage and screen, or for the fellow who consistently makes People magazine's "50 Most Beautiful People" list. But those who know Jackman have described him as very relaxed and down-to-earth. That may be because he has studied philosophy for more than ten years, and Jackman has claimed that this helps him put his fame into perspective. As he told Furnish, "My studies have helped me.... To see the rollercoaster quality [of fame]. I mean, success in this business is very much determined by public opinion, and we all know how fickle that can be." Furnish, David. "Hugh Jackman: From an X-Man to a Song and Dance Man, Hugh Jackman is Redefining the Words 'Leading Man.'" Interview (May 2004): pp. 98–104. Scott, A. O. "Full Moon, Romance, and a Demon Rustler." Review of Van Helsing. New York Times (May 7, 2004). Svetkey, Benjamin. "Monster, Inc. Hugh Jackman Pursues Gruesome Creatures—and the Summer's First Smash—with Van Helsing." Entertainment Weekly (March 26, 2004): p. 22. "Big Tony Winners." CBS News: The Early Show (June 8, 2004). http://www.cbsnews.com/stories/2004/06/07/earlyshow/leisure/main621619.shtml (accessed on June 24, 2004). Blackman, Lori. "'Wolverine' Hugh Jackman" CNN.com: Showbiz Today (July 19, 2000). http://www.cnn.com/2000/SHOWBIZ/Movies/07/19/sbtst.jackman/index.html (accessed on June 24, 2004). "Comics: The X-Men." Marvel Enterprises Web site. http://www.marvel.com/publishing/showcomic.htm?id=4 (accessed on June 30, 2004). Couric, Katie. "Hugh Jack(Man) of All Trades." MSNBC News: Dateline NBC (May 7, 2004). http://www.msnbc.msn.com/id/4925357 (accessed on June 24, 2004). "Hugh Jackman Relishes Performing." MSNBC News: Entertainment (May 11, 2004). http://www.msnbc.msn.com/id/4893079 (accessed on June 24, 2004). "Hugh Jackman's Big Year." CBS News: The Early Show (June 4, 2004). http://www.cbsnews.com/stories/2004/06/03/earlyshow/leisure/celebspot/main620969.shtml (accessed on June 24, 2004).